Attendees at Comic-Con International had a chance to engage with bestselling young-adult author Ned Vizzini (It’s Kind of a Funny Story) and get a sneak peek at his novel of teen geekdom, The Other Normals. Lev Grossman’s blurb reads, “The Other Normals is wildly imaginative, incredibly funny, and weirdly wise. I don’t know where Vizzini gets this stuff – it’s like he’s tapped into the collective unconscious of alienated adolescents everywhere.” Sounds like our kind of protagonist / book! Bestselling young-adult author Ned Vizzini (It's Kind of a Funny Story) is thrilled to visit Southern California's premiere science-fiction and fantasy bookseller his description, not ours -- thanks! for a reading and signing of his new book, The Other Normals! Ned Vizzini is currently considered a "single author." If one or more works are by a distinct, homonymous authors, go ahead and split the author. 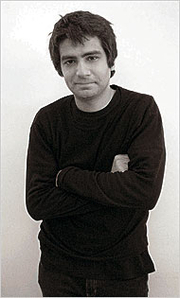 Ned Vizzini is composed of 4 names. You can examine and separate out names.